This week heralded two important session markers: crossover and the celebration of Valentine's Day. Crossover fell on Tuesday, and the House and Senate accordingly finished work on their own legislation. The Senate is now hearing House bills, and the House is currently considering Senate legislation. Additionally, the House and Senate completed their respective budgets on Thursday. House and Senate budget conferees are now tasked with developing a final budget that incorporates elements from both versions. 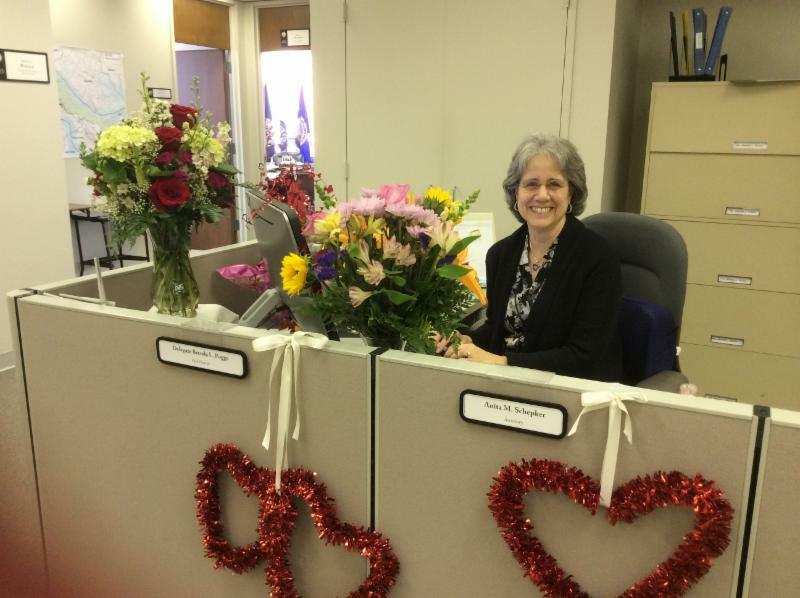 Each year, Valentine's Day is celebrated with great zeal in the General Assembly. Pink and red decorations festoon offices, and the florist is a regular visitor to the building. Pictured below is my administrative assistant, Anita Schepker, surrounded by a sea of holiday decor. The work, however, continues in Richmond. I am pleased to provide an update on the budget as well as news about my legislation that passed during the week. During yesterday's session, I was pleased to vote in support of the House budget. While Governor McAuliffe's proposed budget included over $10 million in new fees and $42 million in new government debt, the House budget eliminated $10.2 million in new fees and funded building projects with existing revenues. Facing the impact of sequestration and federal tax increases, Virginians do not need additional burdens at the state level. To safeguard against future tax increases, the House also invested $99.5 million in Virginia's rainy day fund. Overall, the House general fund budget this year spends $1.1 billion dollars less than last year's budget. In a previous newsletter, I outlined my legislation requiring the Attorney General to defend the Virginia Constitution and the statutes of the Code. I am pleased to share that my House Bill 1573 passed the House of Delegates earlier this week. While the Virginia Constitution requires the Attorney General to perform duties "as prescribed by law," the General Assembly is tasked with making these laws. Accordingly, my bill codifies the Attorney General's duty to defend our Constitution and the laws of the Commonwealth. Like most Virginians, I expect our elected officials to uphold the duties of their job. This bill simply clarifies the exact duties of our Attorney General. Throughout the year, I meet with constituents who offer suggestions for needed legislation. Often these commonsense requests stem from a specific problem that arises due to an ambiguity within the Code of Virginia. Such was the impetus for my House Bill 1645, legislation authorizing bed and breakfast owners to designate areas on their property, both indoors and out, where overnight guests may consume their own lawfully acquired alcoholic beverages. 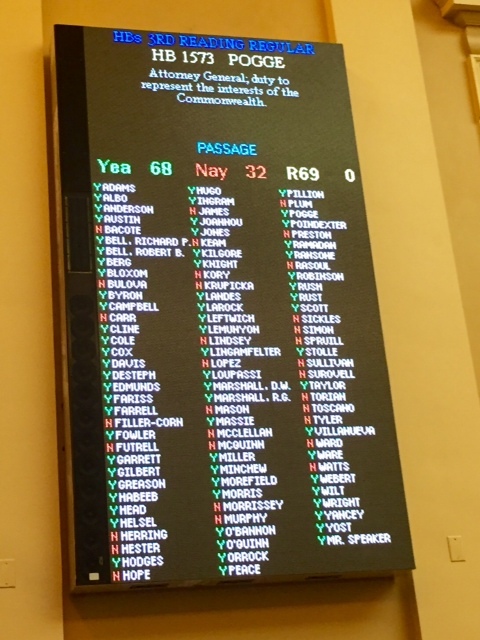 While this legislation addresses the specific concern raised by my constituent, HB 1645 is pro-business, tourism-friendly legislation that will benefit all of Virginia's bed and breakfast owners who desire guests to enjoy the full use of their property. I am pleased that his legislation enjoyed the unanimous support of my House colleagues. Thank you to all who completed my 2015 General Assembly session survey. I truly appreciate your willingness to share your perspective on the issues being debated during this year's legislative session. Your direct input helps me better represent your views in Richmond, and I am pleased to share with you the results of my survey: 2015 Legislative Survey Results. A number of topics were addressed on this year's survey. Included questions cover taxes and spending, K-12 education, higher education, Medicaid expansion, ethics reform, and more. 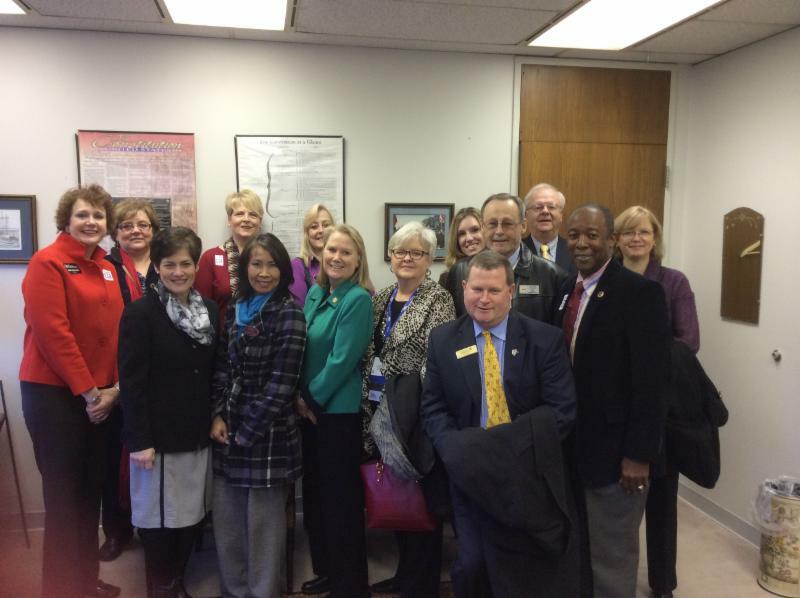 Responses to several questions reflect strong opinions about the General Assembly's priorities and policy initiatives. Continued opposition to Medicaid expansion is reflected in the survey, with over ninety-two percent of respondents expressing disapproval of expansion. Likewise, your desire to reduce government spending reinforces the fact that government must remain fiscally responsible. Virginians are accustomed to living within their means, and our state government should be no different. I remain committed to improving the lives of Virginians through job creation and an improved economy. Underscoring this goal, however, is the recognition that citizens expect accountability from our government. Earlier this week I enjoyed the opportunity to sit down with Delegate Mason and provide a legislative update for residents of the Historic Triangle. The interview is below. Although the General Assembly is currently in Richmond, there are always opportunities for political engagement. Thank you to the following groups and organizations that sent representatives to Richmond this week!